When SEO Taiji's "Nan Alayo" resonates in the middle of the keynote speech, it dawns on you: this truly is a gathering of Hallyu scholars (NB: I owed this trip back to 1992 Korea to ethnomusicologist Keith Howard - SOAS, University of London). But what does "Hallyu" cover, exactly? Answering the question seems to be the most complex task... or maybe I should write "tusk", since I heard at least two references to the old Indian tale of the blind men and the elephant - the one where each man touches a different part of the animal and describes something completely different from all others. 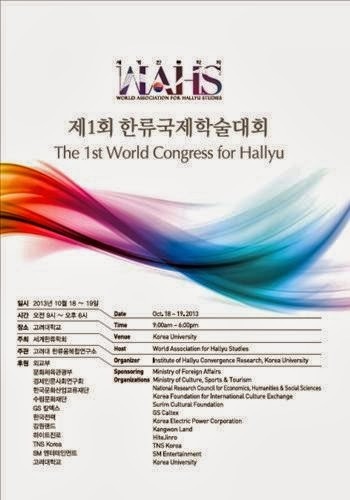 The organization behind this First World Congress for Hallyu, the World Association for Hallyu Studies, leaves definitions up to scholars, who are encouraged to explore all possibilities. WAHS itself is structured around the following sections: Humanities and social sciences, Korean language education and culture, Medical science, Hallyu policy and management, Sports science, Entertainment business, Tourism, Textile fashion and beauty science, and Food. So during the two-day event held on Korea University campus, topics reached far beyond the usual suspects (K-pop and K-drama*). As well as beyond WAHS's 18 regional branches, the 125 panel participants representing 24 nations and all continents (even Antartica was mentioned - by Stephen Epstein in his focus "below the Equator"). The purpose is not to push Hallyu overseas, but "to advance Hallyu Studies as a multidisciplinary body of knowledge and profession serving the public good" (as the mission statement goes), and ultimately peace and mutual understanding, as WAHS President PARK Gil-sung pointed out in his wrap-up remarks. Significantly, the Grand Prize for the Student Essay Contest was awarded to a Palestinian female student (Maysa Sameer), and the First Prize for the Article Contest went to Dredge Byung'chu Käng (USA) for his paper on "transnational transgender personification in Thai K-pop cover dance". I wish I could have attended more panels in this rich program, but I'm glad I didn't miss the "Policy Makers" roundtable on the sustainability of Hallyu featuring representatives from the Ministry of Foreign Affairs (MFA), the Korea Culture and Tourism Institute (KCTI - Ministry of Culture), the Korea Foundation (KF), the Korea Creative Contents Agency (KCCA), the Korea Institute for Design Promotion, the Korea Foundation for International Culture Exchange, the King Sejong Institute Foundation, and KBS Hallyu Promotion Office. What started like a classic, digestive post-lunch series of presentations turned into a lively debate on the most relevant topic - Hallyu's sustainability - when KIM Tae-hwan (Korea Foundation) frankly shared his doubts regarding the future of what appears to be an overblown, short-lived fad marketed as an entertainment commodity, and his wish to see people work on more sustainable approaches. Participants also had passionate discussions around the roles of public diplomacy and of a government often accused of fanning the flames of international hype. Leveraging a network of 200 overseas missions, the Ministry of Foreign Affairs collects all positive and negative feedback about the wave to produce a "Current Status of the Global Village" in partnership with the KF, which explains rather low-profile rethorics: yes we support the Korean wave, but we refuse the driver's seat; Hallyu should neither be politicized, nor be seen as a one-way phenomenon disrespectful of other cultures... The posture is less "we have the answers" than "we need to ask more questions": do we know Hallyu? do we overestimate it? do we have to broaden its scope? Obviously, if the ecosystem seems aware of the need to embrace sustainability, definitions and forward-thinking levels differ a lot. 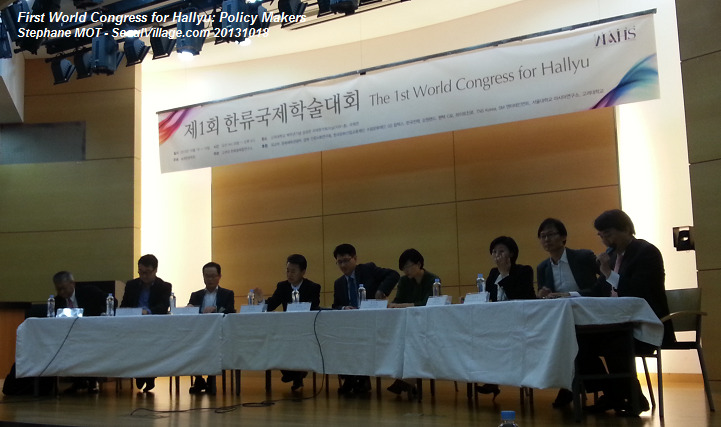 Again, I threw in my two-cents on the issue the following day (see "Heralding cultural diversity: a stronger and more sustainable Korean wave (1st Congress - WAHS)"). 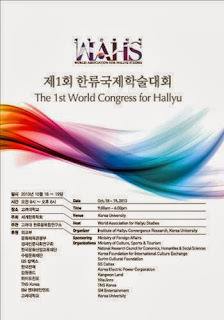 Note that the second WAHS congress will be held in Argentina next year, and that Israel will host a second Middle East - WAHS Conference in May 2014 ("The Cultural Geography of the Hallyu: Mapping the World through Korean Popular Culture", following "The 'Miracle' Narrative of the Korean Cultural Industries: Perspectives from the Middle East" - May 2013). ADDENDUM - read my presentation "Heralding Cultural Diversity: a stronger and more sustainable Korean wave": Part I, Part II, Part III. * or "Koreanovelas", as they are known in the Philippines (where they were initially aired in the local language, with Filipino names and soundracks).